Saughall volunteer day centre has been serving the elderly in our community for 25 years, providing a meeting place for the over 65s who are unable to access other community facilities independently. The service, which is part of Vivo Care Choices, invites members to attend the ‘Friday club’ enabling them to feel part of their community and enjoy eachother’s company. 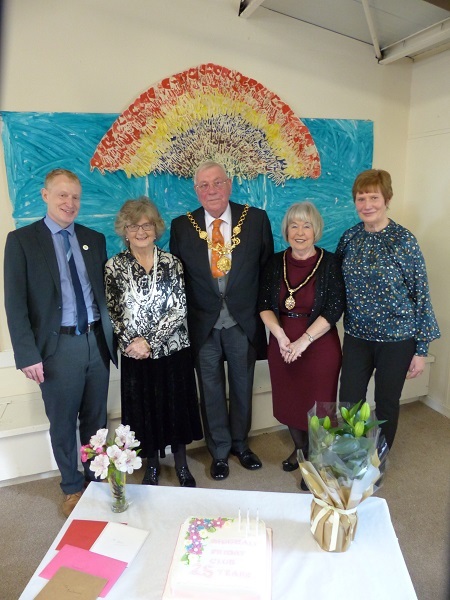 The 25th anniversary of the centre opening was celebrated with all the Friday club members and volunteers, along with a special visit from the Lord Mayor and the Lady Mayoress of Chester. The event included a celebratory lunch and cake, followed by a performance from the local primary school. The volunteer day services are part of Vivo Care Choices, which are also located in Willaston, Waverton and Farndon. The day services enable elderly residents who feel lonely and isolated to attend the centres, helping to improve their overall wellbeing. Activities include games, bingo, quizzes and various arranged performances. Members also enjoy a homemade cooked lunch. The centre was originally opened by Cheshire West and Chester Council and is now part of Vivo Care Choices which is owned and regulated by the Council. If you or someone you know is interested in attending the day centres, please phone 0151 337 4662 to register your interest. To find out more about the services, please go to www.vivocarechoices.co.uk/services/older-people/.